I love big Hollywood musicals - everything from the deeply sinister OKLAHOMA! to the modern glitz of CHICAGO via the genius that is CABARET. I have a fundamental respect for hoofers - old fashioned song and dance entertainers right back to Vaudeville. Nothing pleases me more than seeing a musical theatre artist in their prime - not least Ann Reinking in pretty much everything she did, and Liza Minelli in Cabaret. So despite my reverence for the original 1982 John Huston ANNIE - I was really looking forward to this remake. I didn't quite see the point of it, but I figured the original Strouse-Charmin-Meehan musical could take the reinterpretation. All the best texts can. I guess I realised something was off with this new movie with the opening number - now, as then, "Maybe" - a song that should be poignant and emotional. Instead it was delivered by a bunch of apparently well-fed and well-dressed kids doing this kind of finger-snap dance ripping off the "Cups" song from PITCH PERFECT. Worst of all, I'm not sure if I'm right, but it felt like the lead actress Quvenzhané Wallis didn't have a strong voice and/or was being heavily auto-tuned. Worse still, her lip-synching was off. Things got worse with Cameron Diaz' outsized but somehow messy performance as the modern-day Miss Hannigan - now a drunken foster mom - and the STOMP rip-off choreography for "Hard Knock Life." The movie moved through its gears, sticking fairly closely to the plot of the original, and the focus shifted from the girls to Will Stacks (Jamie Foxx), a cellphone billionaire running for Mayor of New York. His oleaginous spin doctor Guy (Bobby Cannavale) persuades him to take in Annie to boost his ratings much to the delight of the adoring Grace (Rose Byrne). It's in this sequence that I realised that the producers of this version of ANNIE didn't really care about the tradition of musical theatre at all, and hadn't even bothered to cast people who could sing and dance or indeed paid for a proper choreographer. The masterful mansion scene in the original, with an all singing all dancing "I think I'm gonna like it here" becomes a rather thin version with Rose Byrne of apparently so weak a singing voice she just recites her lyrics and zero actual dancing. You know how the plot unwinds. Will Stacks finds he likes the little girl but she still dreams of finding her parents. The mean Miss Hannigan conspires to create fake parents but in Will saves Annie in the nick of time. Here's the thing. The original ANNIE had something to say about poverty and riches, and was at times almost too overtly political. The kids looked like they scrubbed floors for a living and Miss Hannigan looked like a mean drunk. This new ANNIE looks fairly glossy and light. The rough edges have been scrubbed off. The motivation for Will Stacks' workaholic hardness is very thinly sketched and even Miss Hannigan is softened. The sad thing is that we are probably at a time, economically, most akin to the Great Depression. This week, UK headlines are filled with stories about record numbers of people resorting to food banks. This movie could've been made contemporary but still resonant with the themes of the original instead of just being clever-clever for the sake of it. But the ultimate failure is a lack of conviction. It's like the producers just don't believe in musicals, or at least in the charisma and authenticity of casting real musical theatre actors. The only person who really sells the songs is Jamie Foxx, and Cameron Diaz is amazingly probably the next best singer. No-one can dance. They barely even try. Consequently, it's not so much that I don't like this film, but that this film holds an artistic format that I love in contempt. And so, I discard it. 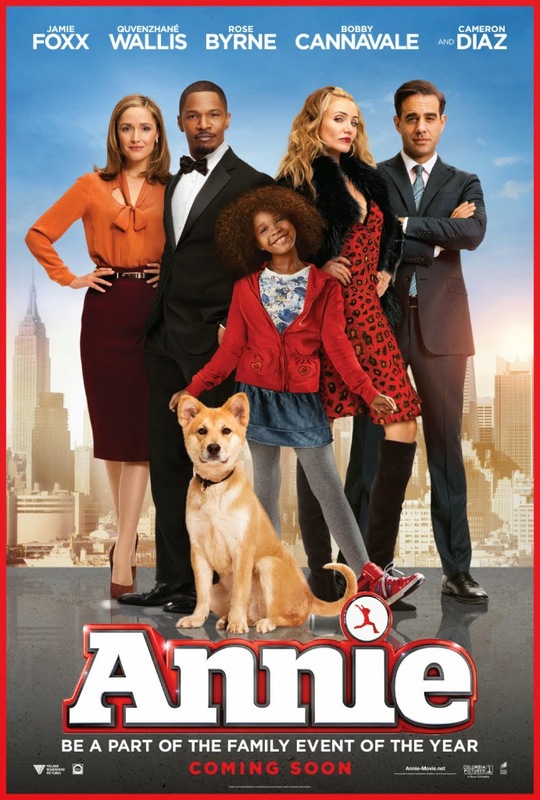 ANNIE has a running time of 118 minutes and is rated PG in the UK. ANNIE will be released on December 17th in the Netherlands, on December 18th in Australia, Israel, New Zealand and Singapore, on December 19th in Croatia, Mexico, Nigeria and the USA; on December 24th in Belgium; on December 25th in the UAE, Austria, Bahrain, Bolivia, Switzerland, Chile, Ecuador, Egypt, Hong Kong, Iraq, Jamaica, Jordan, Kuwait, Lebanon, Oman, Poland, Qatar, Syria and Venezuela; on December 26th in Ethiopia, the UK, Ireland, Romania, and Vietnam; on January 1st in Ukraine; on January 2nd in Colombia, India and Kenya; on January 8th in Peru, Serbia and Slovenia; on January 15th in Germany, Uruguay; on January 16th in Latvia; on January 22nd in the Philippines and Hungary; on January 23rd in Turkey; on January 24th in Japan; on January 28th in Indonesia; on January 28th in Dominican Republic; on January 30th in Spain, Finland, Taiwan, South Africa; on February 5th in Argentina, Slovakia; on February 12th in Brazil and Portugal; on February 27th in Estonia, Iceland and Lithuania; on March 19th in Azerbaijan, Kazakhstan, Malaysia, Russia and Thailand; on March 20th in Sweden; on March 26th in the Czech Republic and Denmark; on March 27th in Norway; on April 2nd in Greece and Italy. I have not seen this and based on your review and my love for the original I think I'll give it a pass and just rent the original again - Carole Burnet as Mrs Flanagan was a joy to watch and Aileen Quinn will always be Annie to me. Exactamundo. Carole Burnet is just class. Seeing her spoof the dancing in Easy Street is just a joy!